Here are some facts about Blenheim Palace. Blenheim Palace is a massive English country house in Woodstock, Oxfordshire. It is one of the largest houses in England and was built in the early 18th century. It was constructed to celebrate Britain’s victory over France in the War of the Spanish succession, and given as a gift to the first Duke of Marlborough, John Churchill. The palace is the key residence of the Dukes of Marlborough. The Column of Victory is 134 feet tall, and features a statue of the 1st Duke of Marlborough at the top. 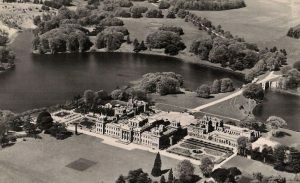 In the late 18th century, Capability Brown was hired to re-landscape the park. During World War 1, Blenheim Palace was used as a convalescence hospital for wounded soldiers. In 1987 Blenheim Palace was labelled a UNESCO World Heritage Site. Sir Winston Churchill was born at Blenheim Palace. Sir John Vanburgh was the architect who designed the majority of Blenheim Palace. However, due to issues with funding, and criticism of his Baroque style, the work was completed by Nicholas Hawksmoor. Today, the palace and its grounds are open to the public. There is a maze, adventure playground, butterfly house and a mini-train, The Blenheim Park Railway. The palace has been featured in many movies, including the James Bond film Spectre, Kenneth Branagh’s version of Hamlet, and Harry Potter and the Order of the Phoenix. The palace is surrounded by more than 2000 acres of parkland. One of the oak trees in the middle of Blenheim Palace’s Park has been dated at 1046 years old. This makes it one of the oldest surviving trees in Britain. Blenheim Palace is the only non-Royal building in England to be titled ‘Palace’. The building has more than 200 rooms and 1000 windows. The Long Library in the palace has shelves containing more than 10 thousand books. The land upon which Blenheim Palace was built is still owned by Crown.